When I was your age, carrots were bigger, and better behaved. So, um, yeah. I don’t really know what to say about this. This is really a thing. I watched the video and I had to check the link to make sure it wasn’t a SNL fake ad, but, nope. I mean, I can get really, truly, excessively, excited about people eating vegetables. Some of my best friends eat vegetables. I was even into it back in university. But is this the best way to promote veggies? Shopping-cart-cliff-jumping through machine gun fire? Explosions? Does this really make you want a carrot? Oh, sorry, marketing execs and focus groups, you were saying— it does? Okay, carrots, you win. I’m just gonna go over into this corner and shrivel up and rock for awhile. Pay me no mind. Ontario experienced an earthquake today at around 1:42 pm. My house (downtown Toronto, near College and Spadina) just shook for about 10 seconds. I won’t lie, at first I thought my neighbours were indulging in a particularly vigorous bout of afternoon delight, but then I realized could feel and hear the whole house shaking, not to mention my own intestines. And my cats looked like their little eyes were gonna bug out. Woulda had to be a pretty mighty performance from Mr. Neighbour. So, earthquake. CRAZY! More crazy? 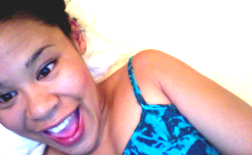 I decided blogging and twittering about it was more important than leaving the house. This post got 1400 pageviews in under 10 minutes- clearly y’all felt it too. UPDATE: I did some research for you! 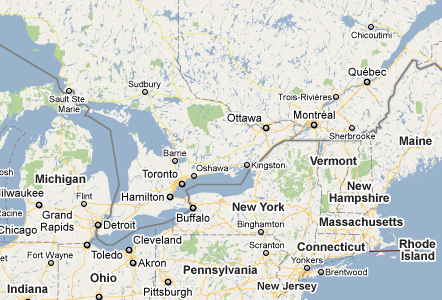 The Canadian quake we just had affected Southern Ontario, parts of Quebec, and parts of New York State and Michigan. The epicentre seems to have been near Ottawa. It registered about a 5.5 on the Richter scale, which ranks it as “moderate”. According to Wikipedia, this means it would be capable of causing major damage to poorly constructed buildings over small regions, but would cause only slight damage, if any, to well-designed buildings. For comparison, the Nagasaki atom bomb caused a 5.0 quake (plus a buttload of radiation fallout and etc), and this year’s Haitian quake was a 7.0, which is fifty times stronger than what just totally made my guts crawl into my throat. (Here’s the Wikipedia page on the Richter scale). Inside, crouch under a table or in a corner- away from exterior walls and windows. Cover your head with your arms. Wait. Outside, go to open ground and hang out. Stay away from trees, buildings, streetlights, and electrical wires. In a car, pull over and stay in the car. Try not to stop under overpasses, wires, buildings, trees, or utility poles. Drink a stiff scotch, if available. First they wax it bare, then they bedazzle it with rhinestones! Thanks to Kelly for the tip. You are currently browsing the archives for the make it stop category.